Here is my pattern, finally! It's ridiculously easy! I saw a beret by Debbie Stoller (Stitch Nation) in Vogue Knitting. I changed it by doing the first section as a k2tog instead of an ssk, but that's the only difference I made. 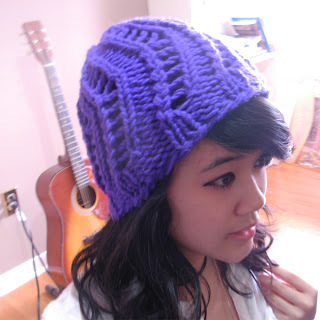 Unless you increase your stitches off the loom, or make wedges, it is difficult to make a beret, so it is just a toque. Sorry if I'm not very accurate; I really like to be flexible with patterns and therefore, I don't have any row numbers for hats. You can adjust if you want it to be a beanie (which is shorter). Some people still have the 41-peg knifty knitter looms, but this pattern works best on any multiple of 4 (so you can also do it on a 36 peg loom). For the 41 peg loom, the last peg should be purled. Yarn size and gauge don't really matter, but I used Red Heart Super Saver Yarn and doubled it up. You just need a fairly thick yarn (5 and up, or doubling up yarns) for the 41-peg loom. I broke the pattern down into 4 parts. Knit 2 together (k2tog) - In the pattern, for the first repeat of the ladder slanting to the right, your first k2tog occurs on peg 4. To do this, take the loop off of peg 3, and then put it on top of peg 4. Yarn over peg 3 and knit together as 1 on peg 4. Slip slip knit (ssk) - ssk - slip slip knit. This is weird in loom knitting because you don't have to do anything (whereas you have to slip the two stitches off the left needle, but I digress). To make a ladder slant to the left, you take the loop off peg 3, and put it above the loop on peg 2, which will now have 2 stitches. Knit those together as 1, and yarn over peg 3. Use whatever you like. I love the cable cast on for hats, because it looks like a thin line from afar and is stretchy. A long-tail cast on is a bit thick, but it also works nicely and is elastic. Because the second half of the hat uses ssk I did a decrease using ssk instead of k2tog. 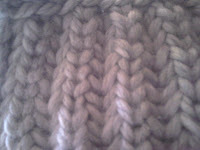 I didn't touch the purl stitches and only decreased on the knit stitches trying to maintain the pattern of the hat. After doing the amount wanted, bind off and weave in ends. If you are having trouble, please read more. Finally! I was supposed to finish this post two days ago, whoops! My excuse is that it was my birthday. Anyways, most of these posts are new videos that go along with articles from loom knitters circle! These are great, especially Bethany Dailey's bind off/cast off comparison.